Last Oct. 24, Filipino K-Pop fans were blown away by phenomenal Hallyu superstars Big Bang in an unforgettable concert at the Mall of Asia Arena. What the fans didn’t anticipate was the arrival of another K-Pop superstar, Sandara Park of Hallyu group 2NE1, who flew in to support her YG Entertainment labelmates. 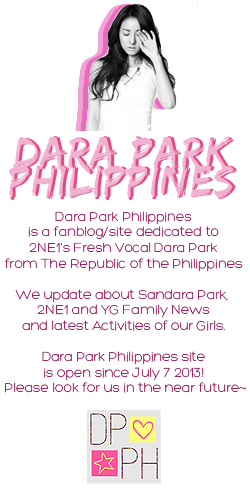 Sandara Park, also known as Dara, holds a special place in the hearts of many Filipino K-Pop fans. Having lived in the Philippines with her family from 1994 to 2007, Park is comfortable with Pinoy culture and fluent in the language. In 2004, after placing second to Hero Angeles in ABS-CBN’s “Star Circle Quest” reality talent competition, she launched a successful entertainment career, until 2007, when it was revealed to a stunned public that she would be part of a new girl group, 2NE1, that would go on to become a runaway K-Pop success. Park flew into Manila virtually unannounced on Oct. 23 She teased fans with a tweet at 5:38 a.m. of the same day, saying “Magandang umaga sa inyong lahat~!!! ang aga ko nagising!!! Have a nice day! :)” (“Good morning to everyone~!!! I woke up early!!! Have a nice day! ;)). When word got out that the charismatic entertainer was in town for the Big Bang concert, fans went on a Twitter frenzy, sending the hashtag #MABUHAYDARA straight to the top of Twitter’s Philippine trends. Over the next few days, Park’s natural charm and self-deprecating humor was evident on Twitter, where she tweets as @krungy21—a reference to her Pinoy showbiz nickname, “Ang Pambansang Krung Krung,” a made-up word that means kooky or mental. Switching from Filipino, Korean, and English, she kept both Korean and Filipino fans up-to-date on her sudden, unexpected vacation. In Manila, she tweeted a photo of herself striking a pose at the Promenade Mall in Greenhills, San Juan. She uploaded pictures of popular Filipino icons, including fast food meals from competing giants Jollibee and McDonald’s. Seemed like Dara missed her Chickenjoy and Longganiza with Rice. Dara also tweeted to followers that she jet-skied in Subic. True to form, she uploaded pictures of the concert, featuring fans (and herself) holding up their fierce Big Bang lightsticks. Days after her return to Korea, Park clearly had a Manila hangover. At 12:14 p.m. on Oct. 28, she waxed sentimental, tweeting the lyrics to the classic pop hit by Hotdog called”Manila.” Dara wrote: “Maraming beses na kitang nilayasan~iniwanan at ibang pinuntahan~parang lalaking mahirap talagang malimutan~ikaw lamang ang aking binabalikan” (“Many times I left~left and went to another place, like a man difficult to forget, I return only to you.”). Over the course of the past week, Sandara Park showed why she is both Korea’s Queen of Social Media and a popular adopted daughter of the Philippines. Since relaunching a Twitter account, she retitled her profile description to “Pambansang KrungKrung ng Pilipinas.” Dara has engaged followers in three languages, kept information coming, and stayed true to herself and her Filipino roots. Few people can do it the way Sandara Park can, and that’s is one of the many reasons why she remains well-loved.